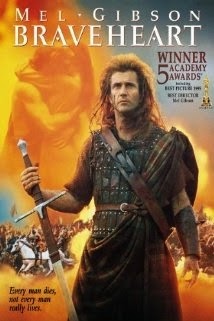 Braveheart is an epic historical movie directed by Mel Gibson. The movies setting is in Great Brittan, about 800 hundreds years ago, in a time were the English dominations in Scotland, landed a disconfirmation and oppression to the Scottish. The film is narrates the life of William Wallace, one of the most important characters in the Scottish rebellion. He was only a child when the English mudded his father and brother. He had to leave his village and went to live with his uncle. His uncle was concerned about William education, he taught him different language and he travelled Europe with Wallace so he wasn´t an ignorant scot. William returned to his village when he grew up, he left as a child and returned as a man. Wallace was truly in love with this women called Murron, the two were full in love, so they didn´t wait and got married, in secret, because in that time the cruel King of England Longshanks order that the nobles of England can reclaimed the wife for the night they got engaged. William protects his wife as much as he could, but the sheriff of the village killed his wife as a sign of William rebellion. That put Wallace on rage and he and his friends managed to free his village and then with the help of other clans he released most of the village of Scotland and he took position of fortifications of the English’s. He became a legend in Brittan; he inspires Scotland to fight with England. He united Scottish for one cause, the freedom. He led his army to an impossible victory in the battle of Stirling. The wife of the prince of England was in loved with Wallace and he told him the things the King was going to do, Wallace was always a step forward the King. But not everything was victories for Wallace, in the battle of Falkirk he was betrayed by his compatriots, even the king of Scotland betrayed him. This battle coasted many deaths and Wallace nearly died. When he got healthy, he started a revenged plan. He killed the nobles that betrayed him in the battle. One day Rupert the Bruce (king of Scotland) wanted an audience with Wallace; the king reflected and made paces with Wallace. Wallace agreed to go, but he didn´t know it was a trap even Rupert the Bruce knew about that complot, it was made by the nobles. He was captured and tortured; he could save his life if he said “please mercy”, but instead of that his last words were “freedom”. This movie is 177 minutes of pure action, suspense and excitement. I totally recommend this movie if you want to have a good time and almost learn something. If you have some travelled in your life this is a movie for you is going to pick up your spirit. This is a movie that shows you everything is possible. "They may take our lives but they will never take our freedom!!"